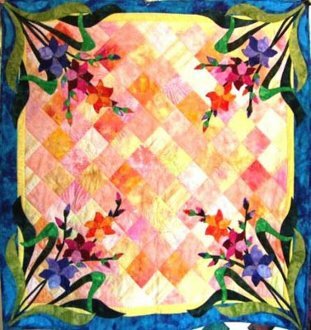 This vivid quilt features the colorful Gladiola, the flower for the month of August. Four multi-hued flower stalks fill the corners of this quick-pieced summer table topper. The bright background of pinks, yellows, and oranges are strip-pieced to make up fast, and the borders are added to finish it off. The floral motifs are fused to make them fast. The applique is "appli-quilted" or stitched down and quilted at the same time! Full color instructions with complete full sized applique templates and placement guides.